Gil Ilutowich was born in Bnei-Brak, Israel, in 1965. He holds a BA in philosophy and Jewish studies from Tel Aviv University, and also studied electronics and practical engineering. 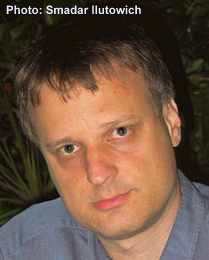 Ilutowich has spent much of his professional life writing and developing educational games and interactive books for children, which have been translated into over 40 languages. He is involved in projects for immigrant children as well as for children in hospital.